Five-day humanitarian truce between Saudi-led coalition and Houthi rebels takes effect. A five-day humanitarian truce took effect in Yemen on Tuesday, though it was preceded by Saudi-led airstrikes on the capital Sanaa, Reuters reports. The ceasefire began at 11:00 p.m. local time, said Brigadier General Ahmed Asseri, spokesman for a Saudi-led coalition which has been striking the country's Houthi rebels since March 26. It is intended to allow the shipment of food and medicine to the country, which aid groups warn faces a humanitarian catastrophe after more than seven weeks of war. There was no let up in fighting, despite the imminent truce, noted the news agency. The Houthis shelled Saudi border areas in Jizan province until the last moments before the ceasefire started, Asseri said on Al-Arabiya television, adding that this gave him no confidence the rebel group intended to keep to the truce. As the ceasefire neared, witnesses said the Saudi-led alliance bombed Houthi positions in the southern port of Aden, where local armed groups were still fighting the rebels. The United States said it was tracking Iranian warships accompanying the vessel bound for Hodaida port, and urged Iran instead to use a UN distribution hub in Djibouti to provide help to people in the war-damaged Arabian Peninsula country, according to Reuters. "We would discourage any provocative actions," said U.S. State Department spokesman Jeff Rathke. Looking to prepare for the truce and jumpstart stalled political talks among Yemen's civil war factions, the new UN envoy to the country arrived in Sanaa, saying fighting would not resolve a conflict that crosses ethnic and religious faultlines. "We are convinced there is no solution to Yemen's problem except through a dialogue, which must be Yemeni," the envoy, Mauritanian diplomat Ismail Ould Cheikh Ahmed, was quoted as saying by the local Saba news agency. 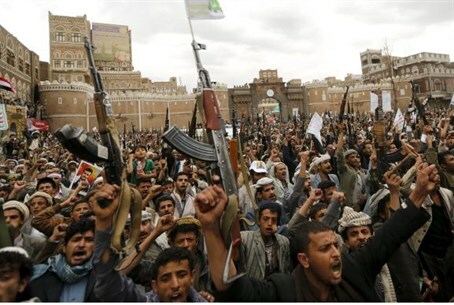 Seeking to restore exiled President Abd-Rabbu Mansour Hadi, who was forced to flee Yemen when the Houthis began marching on Aden, an alliance of Gulf Arab nations has since been bombing the Iranian-backed Houthi militia and allied army units that control much of Yemen. According to Reuters, Saudi-led airstrikes on a rocket base in Sanaa on Monday killed 90 people and wounded 300. If confirmed, the death toll would be among the highest in a single bombing incident throughout Yemen's war. Sanaa residents said there were three airstrikes on a base for army contingents aligned with the Houthis in the north of the capital on Tuesday, sending up a column of smoke.